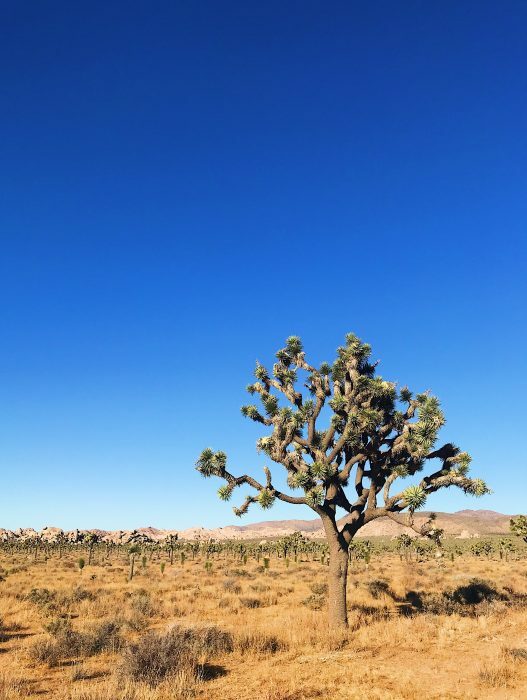 Last week, to take advantage of Ben’s Thanksgiving vacation, we traveled south for a few days, staying for a night in LA (a city that, for me, never disappoints) and then driving east to Joshua Tree. Neither of us had ever been, and it was epic and beautiful, just as we’d hoped. The desert always fascinates me: a wild wasteland yet abundant. 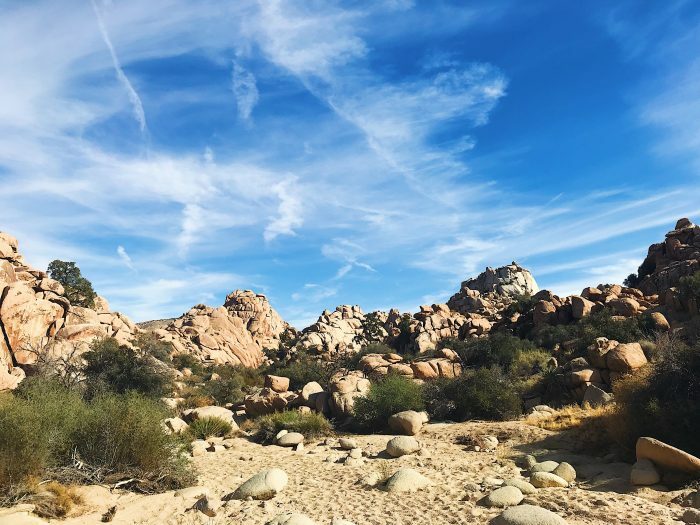 We went on a long hike that ended in an oasis, a gathering of willow trees where the temperature must have dropped 10 degrees and all kinds of plants were growing—only a mile back, it was all rocks and dust and Joshua Trees and vast blue sky. I love traveling for many reasons. High on the list is the opportunity to see something new, a place I’ve never been before, surprising in its uniqueness, provoking new thoughts. It’s one of my favorite parts of any adventure. But as much as I love to travel and try new things, I’m not a totally free-wheeling, super-flexible type—those are just not my strengths. I felt bad about this once upon a time, but I don’t anymore. I have other skills. I am proud of my ability to plan a good meal in a foreign kitchen, to scout out worthwhile restaurants and hikes, to keep track of the budget along the way, to choose well on a new-to-me menu or at a poorly stocked grocery store. There’s an article in the November issue of Sunset Magazine about climbing slot canyons and glamping at Zion National Park—which sounds like a pretty excellent combination of activities, I must say. There was a quote from a middle-aged woman named Lucy who, in explaining how perfect the situation was for her, said how much she loves nature but that she’s “a big scaredy-cat.” And though I’ve never glamped (it is a verb, too? ), I share that perspective and loved seeing it in print. Far too often, we talk about enjoying nature and lacking some sort of earthy fearlessness as diametrically opposed, and that’s just not the case. So in the spirit of adventure-plus-preparedness, I give you an excellent simple recipe, a version of which was on the table at our desert Airbnb for our Thanksgiving-adjacent feast on the holiday. It’s always a trip to cook in someone else’s kitchen, with their pots and pans and not-so-sharp knives and lack of a food processor, using grocery store goods from whichever chain you found on the way. This dish is perfect for such times, whether you’re at an Airbnb relaxing or in your in-laws’ kitchen for the very first time, trying to impress. Consider the ingredient list and instructions loosely; this is an outline that doesn’t require precision. 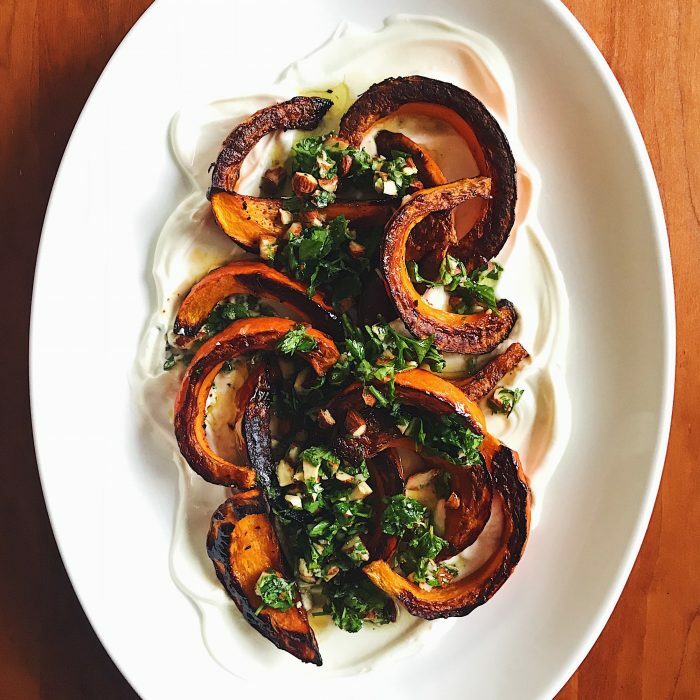 If you want more of the flavorful, herby gremolata, you can easily double what’s called for below. Feel free to switch up the herbs or use another nut if you’d like. 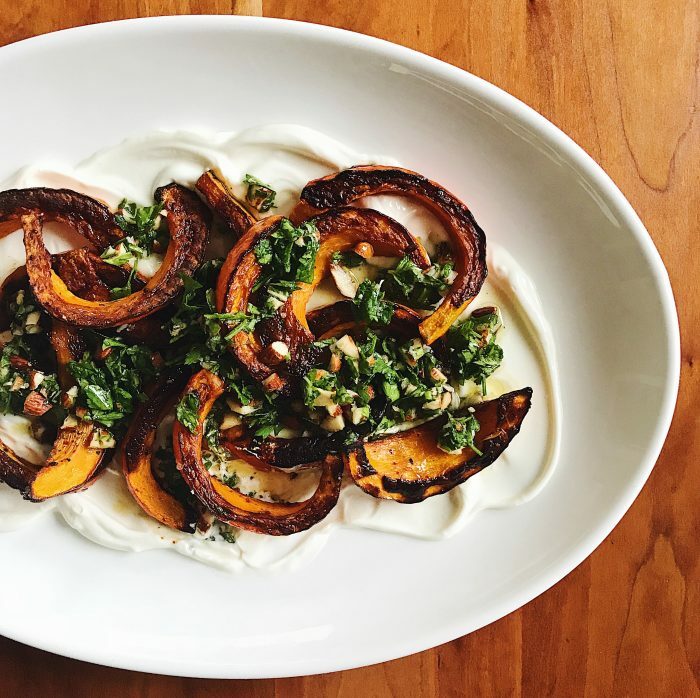 If you can’t find kabocha squash, delicata is just as good, but butternut will work wonderfully, too. In that case, peel the squash before slicing it into large pieces. Halve the squash, scoop out the seeds and slice each half into big crescents, about 1 inch thick. Place the slices of squash on a baking sheet. Drizzle with olive oil (about 1 tablespoon for a small squash and 2 for a large one). Sprinkle with salt and freshly cracked black pepper, plus Aleppo pepper if you have it. Mix well with your hands, right on the baking sheet. The squash should be well coated in oil, but there shouldn’t be any extra pooling on the pan. If the pan is crowded, use a second one so that the squash doesn’t steam. Spread the pieces out evenly. Roast the squash for about 35 minutes, flipping once midway through, until dark golden brown in color. Season the Greek yogurt or labneh with a pinch of salt. Spread on a serving platter. Make the gremolata. In a small bowl, combine the almonds, herbs, garlic, the zest and juice of about half a lemon, a pinch of salt and freshly cracked pepper. Add olive oil to cover, then mix again. Taste and add more lemon juice, zest and/or salt to taste. When the squash is nicely browned, remove the pan from the oven and allow the squash to cool slightly. 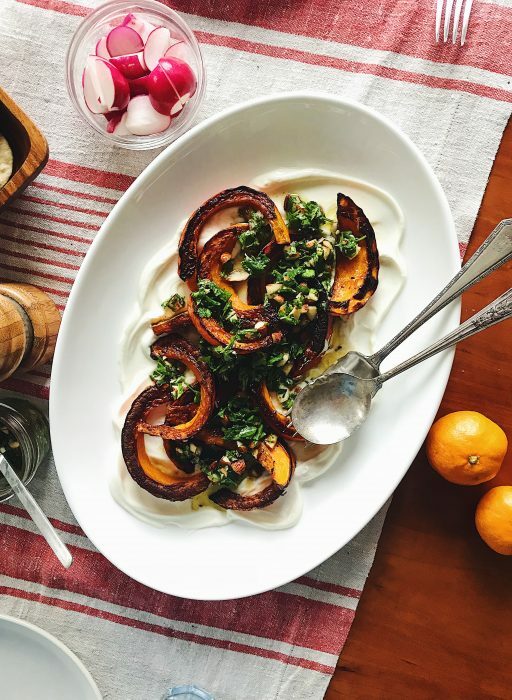 Arrange it over the Greek yogurt and top with the gremolata. Finish with a drizzle of olive oil and an extra sprinkling of flaky salt. I’m glad we had this adventure, and I’m grateful that your skills allowed us to have a great Thanksgiving meal in a foreign kitchen. looks perfectly simple and delicious. So glad you guys had a nice time! The hike sounds perfect. I think you have made some version of this for me before. Thank you for sharing the recipe and instructions! I am going to give this a try. Such a nice combination of good things, and so pretty!